City of Grande Prairie Alderman, Bill Given, is excited to officially confirm his plans to run for mayor in the upcoming municipal election. "I am incredibly proud to be the first candidate to officially toss my hat into the ring for the upcoming election,” said Bill Given. “It's been called the worst kept secret in Grande Prairie, but the truth is that I've been one hundred per cent committed to this campaign for a very long time.” Given continues, "Over the last few months I've been meeting one-on-one with community members to discuss their vision for our community, and some clear themes are starting to emerge. During the summer, I'll use my campaign to expand that dialogue and open it up to residents and neighbourhoods across the city." After serving three terms as alderman, Given brings a unique combination of experience, as well as a youthful perspective to the race. "After nearly 10 years at the council table, I have a clear track record that people can count on and some very firm ideas about what it will take to move our city to the next level,” says Given. "At the same time I'm very familiar with the day-to-day challenges facing families in our city." For the next few weeks, Given's focus will be on his own family. "My fiancé, Susan, and I are busy getting ready for our wedding," says Given. "We're looking forward to finally making it through all the organizing and getting to share the celebration with family and friends." "This summer we'll be launching a new website with complete campaign details, but right now residents have access to nearly 350 articles I've posted over the last three years," says Given. To date, more than 22,000 visitors have viewed the website where Given's articles discuss issues ranging from affordable housing and environment to health care and youth. Elected for the first time in 2001 at the age of 24, Given is the youngest person to ever serve on Grande Prairie City Council. In his three terms with the City, Bill has been appointed to a wide range of committees and boards including all standing committees of council and a wide variety of community organizations. Recently, Bill completed the University of Alberta's National Advanced Certificate in Local Authority Administration (NACLAA) which is a nationally recognized credential for local government administrators. Expanding the Crystal Centre was on the CDC agenda this week. I'm not on the committee but the issue is important, and the money involved is huge so I wanted to be there to be a part of the discussion. I also wanted to solicit some feed back and see what residents thought about the idea and the cost so I made a simple posting to my Facebook status "Crystal Centre expansion: $38M to add 2100 seats, 24 luxury suites & more. I think:"nice to have but tough to do." Your thoughts?" ...the response was great! The posting touched off a discussion that generated 55 comments with friends stating their point of view, asking questions and debating amongst themselves. A lot of this conversation was happening while I was in the committee meeting, and at the same time council members were debating. This got me thinking of the cliche of "The Coffee Shop" as the place that discussion and debate on local issues happens. It makes me wonder if, maybe, our generation has a new coffee shop. I followed up the discussion by posting a full length note (posted below) with my position and some of the details from the staff report so people could see for themselves what council members were basing the newspaper quotes on. The lesson? 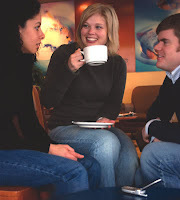 Citizens, even younger ones, do care about their communities and are willing to engage... you just have to be smart enough to know how to find your way to the coffee shop. Hi all, thanks again for the great conversation - I appreciate your input! All in all I don't think we should expand the Crystal Centre to try to compete for the big name concerts that require lots of seats. It's just too expensive and there are other things at play like the fact that the facility in Dawson is part of a group that can book multiple show dates - even if we had as many seats there's no saying we could over come that additional pull they have. I think we do need to spend some time developing a new strategy on how we can ensure the facility continues to be a vibrant asset for our community. Maybe we have to rethink what we want that building to be used for. Maybe there are less expensive renovations that cam make the building even more attractive as a location for other types of events that would still bring people to GP and drive economic activity downtown. We need to talk about that and make a plan. • the concourse level is a combination of new and existing construction. One of the main features... is that it will provide the main means of access to both the existing north and south concourses. • the upper level... has probably the greatest "enhanced" value... as it provides a number of leasable suites. ... 8 suites plus a party room. • Conversion of the current administration area in to back of house storage, expansion of the existing concession and a reduction in the overall size of the shared lobby which effectively becomes part of the Bowes Family Crystal Gardens. • at the upper level a major provision of suites and a lounge overlooking the Bowes Family Crystal Gardens. - to the west and expansion to the property line and 101 Street. This expansion is primarily about providing additional back of house space to the event level. It's main benefit is the increase in additional flat floor seating for both end-stage and centre-stage concerts. - little detail given in the report but would likely include additional space for breakout rooms which are a frequent request for conferences and events as well as floor replacement. - 24 suites leased for 3, 5 or possibly 10 years. Prices could range from $17,500 to $22,000 per year. At the bottom end that would provide $420,000 per year in revenue and on the top end it would be $528,000. - 100 large, padded seats, in prime positions. The would be leased out yearly for between $500 to $700 and the lease holder would have right of first refusal to purchase their seat for all events. Approx revenue per year; $60,000. - a 5 to 10 year agreement for the naming rights of the building could generate $75,000 to $100,000 per year. - we currently charge a small fee on the price of each ticket that goes towards capital improvements like the new sound system in the Bowes side, new theatre draping curtains. Currently the fee sits at 4% of the ticket price to a maximum $1 per ticket and is being saved to replace the digital sign along 99th Ave that has been out for years. This could be increased to 5% and a maximum of $2 per ticket, generating about $75,000 per year. On a side note, I suggested that we should consider this whether or not we do the expansion. - charing for lots to the West, South & East of the building. Could generate $50,000 to $80,000 per year. 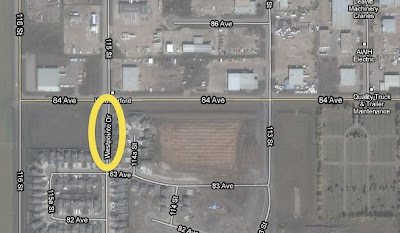 Starting Monday a major intersection to the Westpointe neighbourhood will be closed for two weeks while the city does work to facilitate the twinning of 84th Avenue. The section of road is 115th Street marked below in the yellow circle. The city media release below covers the details but residents in the area will have to use alternate points, like 113th street to the East, to get into and out of the neighbourhood. Motorists are advised that 115 St. between 83 and 84 Avenues will be closed for two weeks beginning on Monday, May 17. 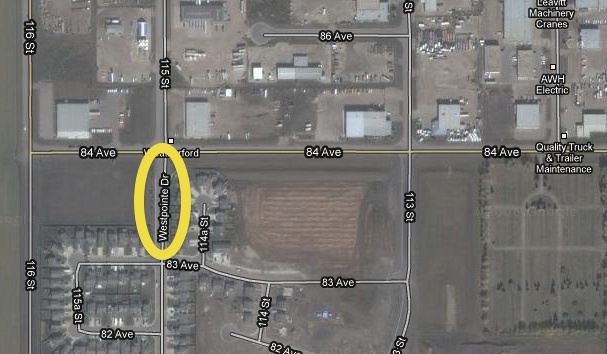 Excavation work on 115 St. is required for the twinning project in the 84 Ave.-116-108 St. area. Commuters are asked to use alternative routes. Many time over I've highlighted the fact that in Alberta, provincial legislation creates an uneven playing field that financially disadvantages some municipalities. Essentially, in many areas the province has funding programs that create artificially uneven playing fields. The funding formula for police in the province is probably the prime example of this. In fact I highlighted it in this post from 2007. With the provincial cabinet making a tour of the province I'll press them on the issue again as it has a big impact on city residents. • Towns and cities with a population from 5,001 to 20,000 receive a $200,000 base payment plus an additional $8.00 per capita. • Cities and urban service areas with a population from 20,001 to 50,000 receive a $100,000 base payment plus $14.00 per capita. • Cities and urban service areas with a population over 50,000 receive grants of $16.00 per capita. The grant to cover 6% of The City of GP's cost is in contrast to the surrounding county, towns and village who are under no obligation to pay anything for towards the cost of RCMP service as the province covers 100% of the cost. As I noted back in the 2007 post to it's credit the County of GP does choose to hire additional RCMP at their full cost (I think it might be a total of 5 members now) which, in very round numbers, costs approximately $600,000. Of course the advantage is that we are largely in control of our destiny when it comes to how many police we have - council makes the decision on when and how many RCMP officers we need to hire. But on the other side of the equation taxes in the city have to be higher to pay for those police and this added burden decreases the City's ability to be financially competitive with surrounding municipalities like the county. So those who would like to see city taxes as low as the county should support our efforts to lobby the province make police funding more equitable. If it were we would at least have a fighting change. Constable Ellen Archibald will assist you in learning how to be safe and secure at home and away from home with this two-hour Personal Safety course. Bring your questions and go away feeling more able to handle personal safety issues in your life. Visit the COW (Classroom on Wheels) bus at the Library and learn with fun activities. For families with children age 6 and under. Drop-in. While at the COW bus, be sure to pick up your FREE ticket to special cow themed programs at the Library on Tuesday afternoon and evening! Make a beautiful handcrafted gift for your mother, grandmother, aunt or another special person! Master Sculptor Chris Jammer will teach you how to sculpt. Registration limited to 12 crafty kids ages 8-12. If you register and cannot attend please telephone 780-357-7454 so another patron may attend. GPPL is pleased to welcome Alberta author Shirlee Smith Matheson. Please join us as Shirlee shares her new book, Jailbird Kid. Check out her website atwww.ssmatheson.ca For students 12 and up. Registration required.